I joined the Department of Education of Ithaca College in Fall 2011 after serving on the faculty of The Ohio State University (Mansfield, OH) and Furman University (Greenville, SC). 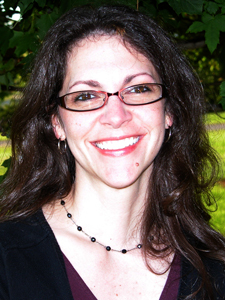 My research has primarily focused on the resources linguistically and culturally diverse children bring to literate events, although I also conduct research on teacher-inquiry and pedagogies of equity. Over time, I have developed a particular interest in how young children understand issues of race, class, and faith. Classroom read-alouds have been valuable spaces in which teachers and I have been able to learn more about how children’s understandings of these topics are developing, how their inquiries into these topics are mediated, and how children use these understandings to support their emerging literary understandings. I have also participated in multiple teacher-inquiry communities, exploring methods to combat homophobia and heterosexism in classrooms and finding ways to better understand and increase the engagement of quiet or reluctant students. Students, classroom teachers, and I have jointly presented research at national and international conferences or co-authored research papers and book chapters as a result of our collaborative work. I welcome inquiries from IC students or local classroom teachers interested in exploring applications of social, critical, and experiential theories of reader response and/or qualitative practitioner-research together. Copenhaver-Johnson, J. F. (2010). Learning about heterosexism as a teacher educator: The resistant student as catalyst for change. In M. Blackburn, C. Clark, L. Kenney, & J. Smith (Eds. ), Acting out: Combating homophobia through teacher activism (pp. 17-36). New York: Teachers College Press. Copenhaver-Johnson, J. F. (2007). Rolling back advances in multicultural education: No Child Left Behind and “Highly Qualified Teachers.” Multicultural Perspectives, 9(4), 40-47. Copenhaver-Johnson, J. F., & Copenhaver, A. R. (2007). Issues of representation in young adult literature with diabetic protagonists. The Dragon Lode, 25(2), 39-45. Copenhaver-Johnson, J. F., with Geiger, S. (2007). The presence of homophobia in fieldwork: Preparing pre-service teachers to challenge heterosexism and homophobia. Penn GSE Perspectives on Urban Education, 5(1). Copenhaver-Johnson, J. F., Bowman, J. T., & Johnson, A. C. (2007). Santa stories: Children’s inquiry about race during picturebook read-alouds. Language Arts, 84, 234-244. Copenhaver-Johnson, J. F. (2006). Talking to children about race: The importance of inviting difficult conversations. Childhood Education, 83, 12-22. 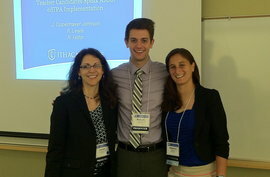 Presenting at the Association of Teacher Educators Conference with graduates Robert Hohn '14 and Rebecca Lewis '14.